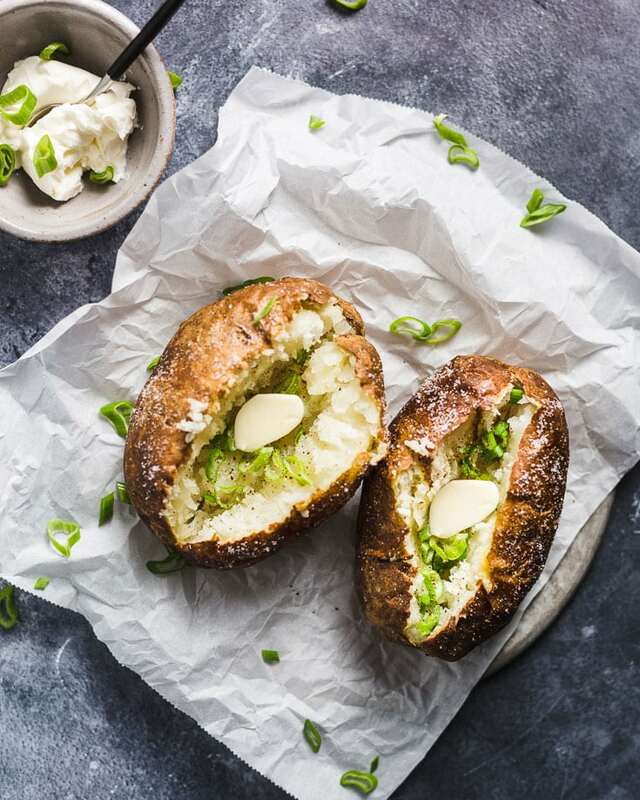 Perfect baked potatoes made in the air fryer come out light and fluffy interior, crispy skin and are much quicker than in the oven. 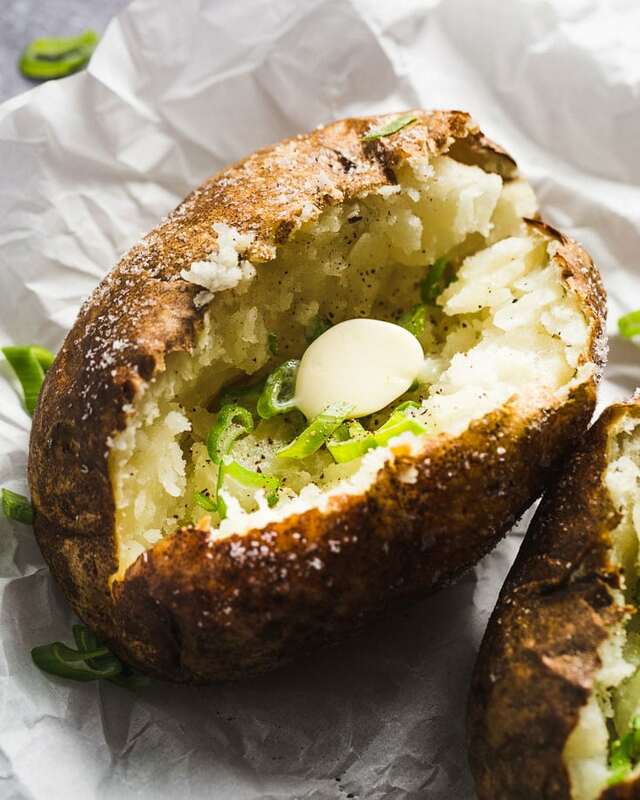 The perfect baked potato is light and fluffy on the inside and has a crispy flavorful outside. It also has to be super hot all the way through to the center for melting all those favorite toppings together to create something worthy of being the main attraction. This is one of those recipes that is so simple it really isn’t a recipe. I had asked myself if you can bake a potato in the air fryer. Turns out that the answer is a definite yes, and it comes out great. Here’s the recipe just in case you want to know how to make the perfect crispy fluffy baked potatoes in way less time than in the oven. Air fryers just seem to make everything better. A lot of the time, this means healthier cooking because you use less fat. In the case of the baked potato, it doesn’t really make baked potatoes healthier, but it makes the cooking time so much quicker. The air fryer speeds up the baked potato cooking time by about 15 to 20 minutes. This is reason enough to make it your go-to method. 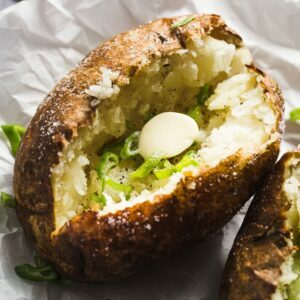 While you can also make a baked potato in the microwave in about 10 minutes; it’s never going to get that delicious crispy skin and the inside is a bit more prone to get waxy rather than fluffy. 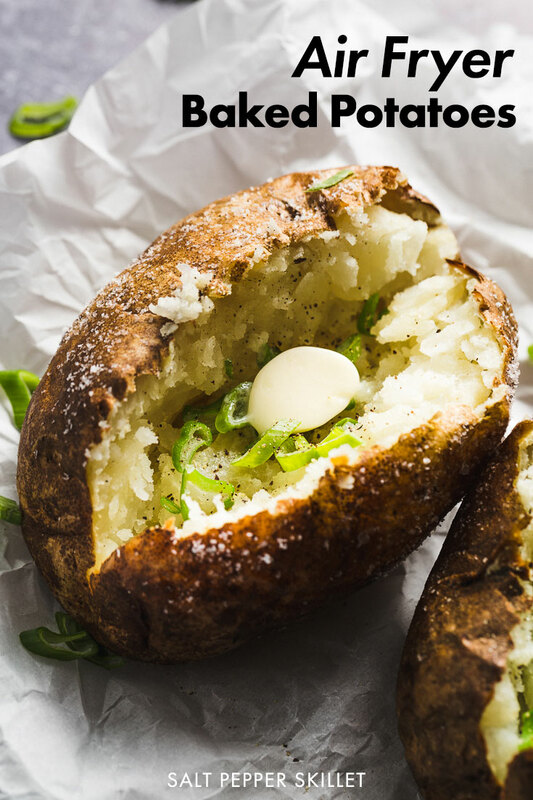 Cooking a baked potato in an air fryer takes between 30 and 40 minutes, but depends your specific air fryer, the size of the potatoes and how many you are cooking at the same time. Scrub and dry the potato well. The dryer the potato is, the crispier the skin will get because it will be frying instead of steaming. Let it go longer if needed. The magic number is 205º F for the internal temperature. Use a Thermapen instant-read thermometer (affiliate) instant-read thermometer to verify the internal temperature of the potato. They will be light and fluffy at 205º. What type of potato is best for baking? Russet potatoes are the best type of potato for baked potatoes because of their high starch content. This makes them much more absorbent for all those amazing toppings you will be adding. Contains affiliate links where I will earn a small commission if you make a purchase, at no extra cost to you, which helps support this site. 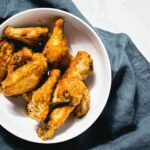 Air Fryer: I use and love the amazing Breville Smart Oven Air because it has so many uses besides air frying. Instant Read Thermometer: The Thermapen Mk4 is the best probe thermometer on the market and is an essential tool that’s worth every penny. 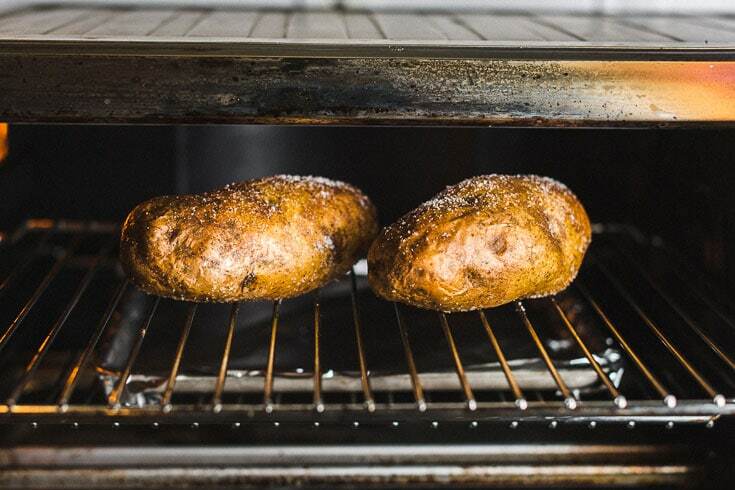 Preheat the air fryer to 400º F.
Clean and dry the potatoes with a towel. Drizzle a little olive oil all over the skin, then sprinkle some kosher salt on top. 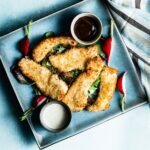 Place in the air fryer basket and cook for 30 to 40 minutes, or until they reach an internal temperature of 205º F. It might take longer depending on the size of the potato, your specific air fryer and how many potatoes you are cooking. Use a fork to slice and open the potato right before adding your favorite toppings and enjoying. Recipe is for one potato, but can be scaled up to more. Cooking times might increase slightly. You can do the pinch test to see if the potatoes are finished cooking, but checking the actual internal temperature is more accurate. 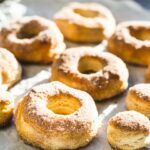 4 ingredient cinnamon-sugar air fryer donuts ready in less than 10 minutes and will satisfy that donut craving.